The music video for "Sometimes A Fantasy" was quite clever, with Billy playing two characters. He is almost unrecognizable as the "greaser" character with his beard and slicked back hair. © 1980 Sony BMG Music Entertainment. The second track on Glass Houses, "Sometimes A Fantasy," continues the harder sound of the album. It's hard driving, manic song with a staccato beat like many New Wave rock songs from that time. The meaning of the song is straightforward, sometimes a fantasy about someone is just as good as the real thing. In a nice bit of alliteration, Billy sings that while it would be better if his fantasy girl was here to hold him, "be better baby but believe me it's the next best thing." 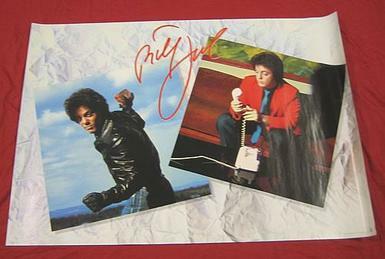 The music video for the song is one of the first of Billy's "acting" music videos in which he acts out a concept rather than just performs the song. Apparently Billy himself came up with the concept of talking or singing into the telephone. Many fans did not recognize that the bearded "bad guy" in the video was also Billy. The video appeared in heavy rotation on MTV. The single version of the song was actually longer than the album version, featuring a longer guitar solo by David Brown (rather than fading away). It can be heard here. Toward the end of the single version Billy yells out, "I've got blisters on my blisters!" a reference to Ringo Starr on "Helter Skelter" screaming "I've got blisters on my fingers!" "Sometimes A Fantasy" reached #36 on the Billboard charts, one of four top 40 singles from Glass Houses. Billy on "Sometimes A Fantasy" from SiriusXM. In 1987, during one of Billy's groundbreaking concerts in Russia, he had an onstage tirade while performing "Sometimes A Fantasy," and famously flipped over a keyboard. Billy was upset that the film crew or lighting personnel were lighting up he audience and inhibiting their participation in and enjoyment of the concert, as The New York Times reported. But that didn't prevent his record company from making a great live music video from his performance many years later when A Matter of Trust: The Bridge To Russia was released. See the video below (right). Billy and Christie at the Hard Rock Cafe NYC in front of a wall-mounted piano that Billy donated to commemorate his Russian tour and his trashing of a piano while performing "Sometimes A Fantasy. Photo: Larry Busacca (1988) via Getty Images. Billy performs "Sometimes A Fantasy" live in Houston in 1979 before the release of Glass Houses in 1980. Billy performs "Sometimes A Fantasy" live in Russia in 1987 before a raucous and well-lighted crowd. This was the 80s.